If you're just starting out it can be a bit of a head-scratcher of a mystery. How to plant in a layered garden? What vegetables to plant and when? You've built your no dig garden. There it is, your work of art like a new blank page waiting for you to create your edible masterpiece. No dig gardens are more successful if you plant seedlings rather than seeds. The seeds can get lost in the mix and the top mulch can blow over them. You are less certain about where everything will come up. With seedlings, you have a better idea of where things are. Also with the rich organic materials in this sort of garden you can plant more intensively than you would with a normal garden. What will do well? Beans, peas, capsicum, eggplant, tomato, lettuce, sweet corn, broccoli, spinach, cabbage, cauliflower, Brussels sprouts and vine crops like melons and pumpkins. Have a browse at this List of Vegetables to Grow. Carrots and other root crops should not be tried until the bed is more mature with decent friable soil, otherwise you will get knobbly, uneven produce. If you've only got a shallow layer of compost or soil on top, poke medium-sized holes through the top layers and put a handful of soil/compost in each hole and plant your seedlings there. Once your seedlings are in place, cover exposed areas with another layer of mulch such as straw, grass clippings or leaves. To discourage stem rot, try to keep the stems of your young plants clear of the mulch, or at least don't pack the mulch hard around the stems. Of course you can start off with seeds, particularly biggies like beans, squash and similar, but especially with preparing soil for a vegetable garden in the first year, the layers are bulky and not merged, so best to wait a good few months. To sow seeds after building your wonderful creation, push away the mulch, make a shallow trench and add a layer of good soil, sprinkle seeds, then cover with fine soil. Keep the mulch away from seeds and only bring it closer once the seedlings are strong little plants. Before planting vegetables, work out where any paths or stepping stones should go if you have a large area. Ideally, build your vegetable gardens twice as wide as your arm length. By that, I mean make sure you can reach into the garden to the halfway mark for harvesting, weeding and... ooh what are those holes... de-slugging. Try to avoid walking on your no dig garden. It will compact the layers of organic material and may cause problems later. It may also track undesirable things (weed seeds especially) into the bed. A good idea, if you want to plant out your garden the same day you build it, is to water the layers of materials as you lay them down. The straw layer in particular takes some time as straw does not readily absorb water. Pre-soaking the bales in standing water can also help if it's an option for you. With a no dig garden, you are quite literally unrestricted to size or shape within your land boundaries. So if you are happily whistling and planting away and find no more room at the inn, dump some new layers down and hey presto, you now have a instant strip of garden to pop those last seedlings in. Try some different things. Plant your climbing beans with your corn so one supports the other. Put some herbs around your cabbage or tomato plants. Some of the principles of companion planting will provide inspiration. Organic gardening is all about a garden in tune with itself. Plant in clumps rather than rows if it suits the sun situation. Rotate your crops so you take full advantage of your growing season. 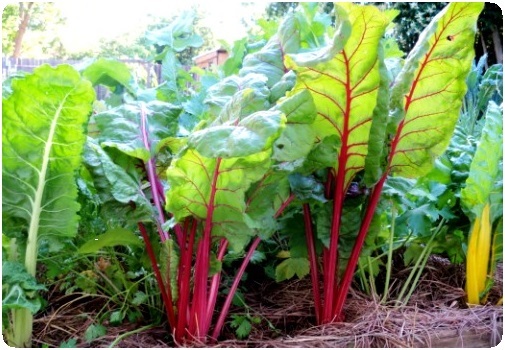 The secret to healthy plants and easy vegetable garden maintenance is to plan a vegetable garden first.